Click on the SEO Report tab in SEO SpyGlass — and in a couple of seconds this brings you to see a real eye–candy thing. Probably after that you won′ t even want to look into the tables you checked before. Yes, they′ re only a mere part of what this cutting–edge software does. Right in front of you is a brilliant report that makes all things crystal clear, even if you′ re completely new to SEO. SEO SpyGlass has carefully sorted out analytical data you saw in the table — and arranged it into a conveniently designed SEO Success Blueprint Report. That′ s your small personal guide to link building success. 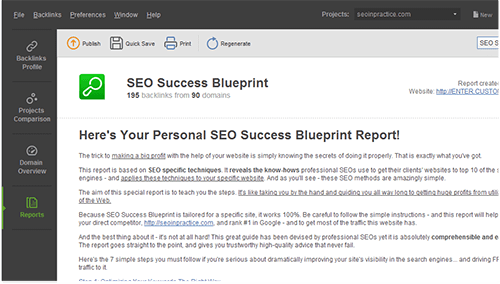 SEO Success Blueprint report shows sources of one–way and reciprocal links that can be the most profitable for you. So look what′ s inside and trust all directions you find there. Switch from one section to another — and you′ ll see the link–building tips that would be pretty hard to figure out yourself. As soon as you′ ve got your Blueprint report in front of you, this means SEO SpyGlass has already done plenty of thousands–dollar–worth work for you. Do not waste your time and money on link brokers. Look in SEO SpyGlass to find best links to get. DO IT NOW! Run a check of your leading competitor with SEO SpyGlass and use link quality factors that it displays to choose where to get links from. Contact webmasters of sites that you chose to request links. Follow directions of SEO Success Blueprint. In SEO SpyGlass, you′ re told what, when and how to do with your links. And you needn′ t worry about being safe on your way to top 10 with this link building. These are links that were found and will work personally for you. This is great tool, I will be considered check out it to provide SEO service for my client. I just got spyglass and this guide is super helpful. Thank you! Awesome Article full of information about latest SEO techniques. SEO SpyGlass is an awesome tool. 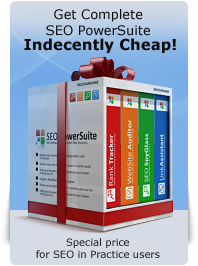 I love the whole SEO Power Suite and can't wait to share this guide with others. It seems to be a useful tool, that I didn't know. Only a consideration: Are reciprocal link useful or useless? Or even harmful? Google for example doesn't love reciprocal link, but only unique link. I was surprised to find several different techniques my competitors were using. I simply merge their secrets into what I was already doing and shot past them! Woohoo!! Good stuff! It is laser sharp tool just like laser treatments AKA LaserBehandling i Goteoborg !